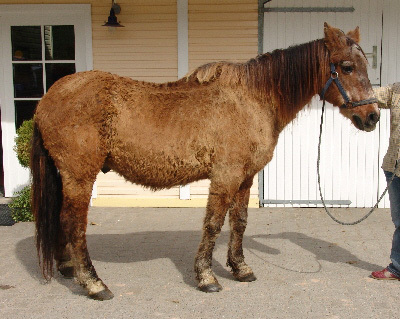 A horse with a lengthy coat of hair, a common symptom of equine Cushing’s disease. Equine Cushing’s Disease is one of the most common hormonal disorders that occurs in horses. It is normally due to a tumor, or an increase of cells in the region of the pituitary gland. The tumor or increased number of cells results in the increased production of the stress hormone Cortisol, or mimicking cortisol-like compounds by the adrenal glands which are located near the horses’ kidneys. The most common sign of Cushing’s Disease in horses can be detected from the horse’s haircoat. Anything from abnormal shedding to a wavy coat length can be a sign of Cushing’s Disease. A common sign is a horse that fails to shed in the summer compiling a lengthy coat of hair. Increased urination is also a common sign as Cushing’s may cause a horse to surpass the normal 5-8 gallons of water which is the common amount consumed by horses daily. Loss of muscle and the appearance of a pot belly are also occasional signs of the development of the Cushing’s Disease in horses, as well as chronic or relapsing Laminitis. Although not restricted to older horses, Cushing’s Disease is most commonly found in aging horses. The pituitary gland is located near the base of the brain and is often referred to as the “master gland” because it controls the body’s hormonal system. It is most commonly believed that the cause of Equine Cushing’s Disease is the development of a tumor in the pituitary gland which causes the adrenal glands near the kidneys of horses to produce too much of the stress hormone known as Cortisol. The normal functions of Cortisol in a horse range from regulating blood pressure, heart function, and metabolism to regulating muscle tone and helping the body respond to stress. The overproduction of Cortisol is what causes the Equine Cushing’s Disease and its toll on horses. If not managed properly, horses with the disorder may expect to live between 5-7 years. Failure to manage the disorder according to proper conduct can result in a dramatic decrease of life expectancy. It is also possible that if the tumor increases greatly in size, the horse may become blind. DIET? The objective is to feed a diet that has less than 10 to 20 percent of total digestible energy (the combination of sugars and starch, or NSCs). High-fiber components, such as these found in hay, hay cubes, pasture, and beet pulp, should constitute the main portion of a senior horse’s diet. Most horses will eat between 1½ to 2 percent of their body weight per day in forage. (For example, a 1000-pound horse should be fed 15 to 20 pounds of hay per day.) It is important to recognize that some hays may contain high levels of NSC, depending on the species of grass and when and how it was harvested. Older horses often have dentition problems, too, so provide good quality hay and feed that is easy to chew. RS Garewal & Sons sends our Alfalfa & Bermuda Grass to a lab for regular, nutritional testing. Because our grasses are lesser in starch/sugars, you can feed with comfort, knowing your horse will love our grasses and their diet will be Cushings friendly.